It's a whole new campaign, for street samurai with the guts to change Berlin for the better. 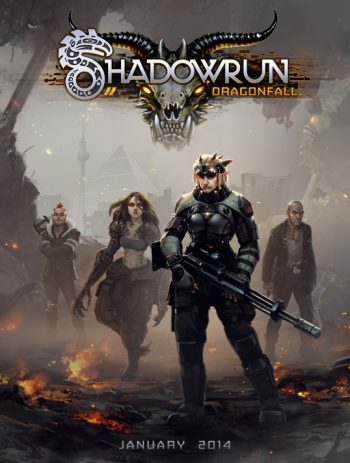 Harebrained Schemes is taking its Shadowrun Returns to Berlin, in its new Dragonfall expansion. It's up to you to survive the Flux-State that is the Free City of Berlin, but there's something mysterious going on behind the scenes. "As you find yourself drawn into a maze of veiled dangers and strange machinations," says Harebraned, "you will come face-to-face with a grim spectre of the past." That, some wÃ¼rstl and a decent LÃ¶wenbrÃ¤u, and I'm sold; but that's just me. There are new weapons, cyberware, and insidious enemies stalking your team in this full-length campaign. Plus the campaign editor got an overhaul, making content creation much simpler, which will no doubt please the storytellers out there. Backers get this one for free, but the rest of us pay either $14.99 for the expansion, or $24.99 if you want to buy the main game and Dragonfall together. January 2014 is the projected release date.